The ONE MORE TIME - the exceptional way to listen to music. Today's life-style has rediscovered the nostalgic charm of the forties and fifties. One More Time combines both. The faithful design of the legendary 1015 of 1946 is the ideal casing for the sophisticated Deutsche Wurlitzer GmbH CD changer. Now the music of Glenn Miller sounds in pure CD quality. 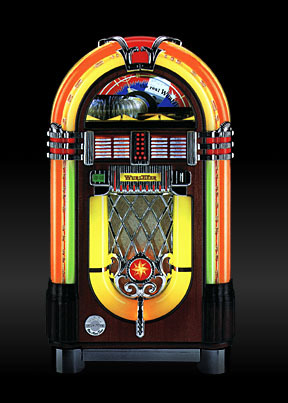 But not just Glenn Miller, the One More Time CD plays more than 1200 hits and evergreens in superb laser sound quality. 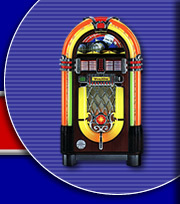 Presentation of all tracks from 60 CDs for direct selection and display of further 40 CDs for album play on title cards inside the jukebox.